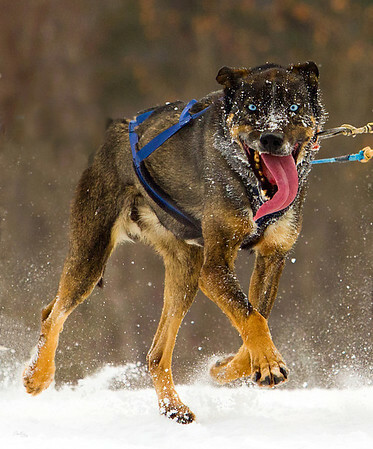 Every year the Lakes Region Sled Dog Club hosts a weekend of Sled Dog competitions. 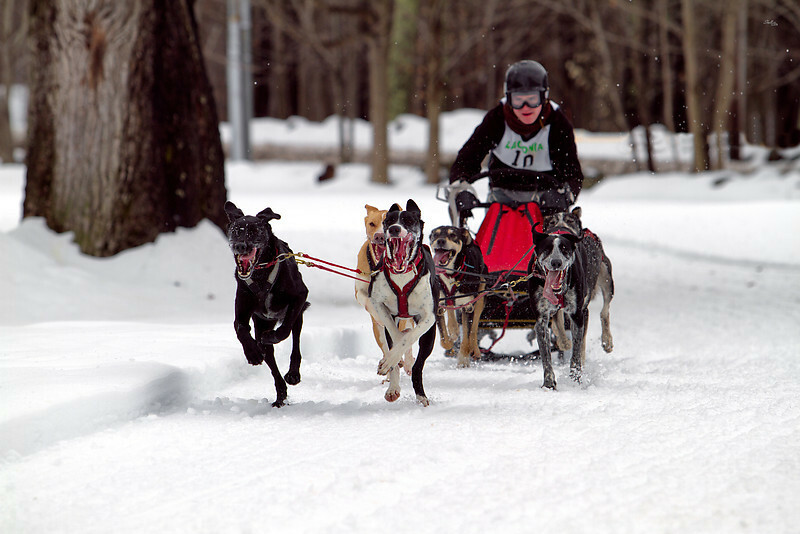 This is Team 7 from St Raymond, PQ on Saturday's race of the Open in 2014. This competition runs all 3 days on a 15 mile course. This team placed 4th on Fri, 5th on Sat. and 1st on Sun, finishing 5th overall. A lot of searching when into finding this spot. Most of the trees and shrubs are bare and make for a dismal background. My camera and myself were covered in camo gear and I was crouched down amongst a bush in the deep snow hiding so not to disturb the dogs. Usually the dogs eye me as they run by, but this group was focused until they heard the clicking of the camera. This dog collapsed as soon as they crossed the line. 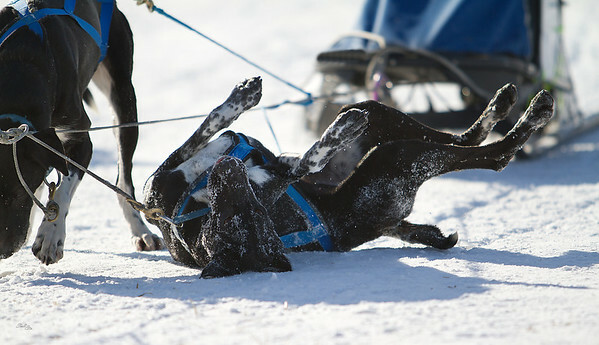 He slid on his back until the group came to a halt, and then he stretched out on his side. Taken during the LSSD in NH 2011. 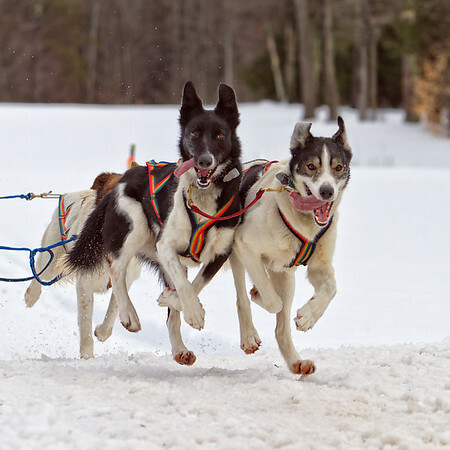 Two sled dogs that made me laugh every time they went by. They were eager and full of energy. The one on the left always seemed to be surprised to see me and would add a little jump towards his partner. 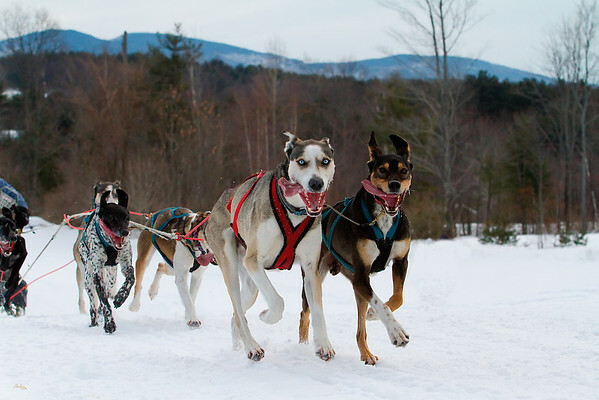 Every year in February the Lakes Region Sled Dog Club hosts a weekend of Sled Dog competitions. This competition runs all 3 days on a 15 mile course. This is Team 8 from St- Gabrielle -de-Rauli, PQ on Sat. This team placed 4th on Fri, 1st on Sat. and 3rd on Sun, finishing 2nd overall. A lot of searching when into finding this spot. Most of the trees and shrubs are bare and make for a dismal background. My camera and myself were covered in camo gear and I was crouched down amongst a bush in the deep snow hiding so not to disturb the dogs. Usually the dogs eye me as they run by, but this group was focused until they heard the clicking of the camera. 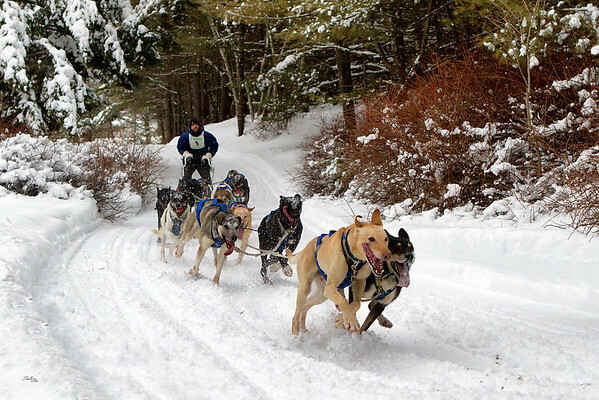 Laconia Savings Sled Dog Derby in NH 2011. This is team 5, they are on the return leg and had just climbed a long hill. 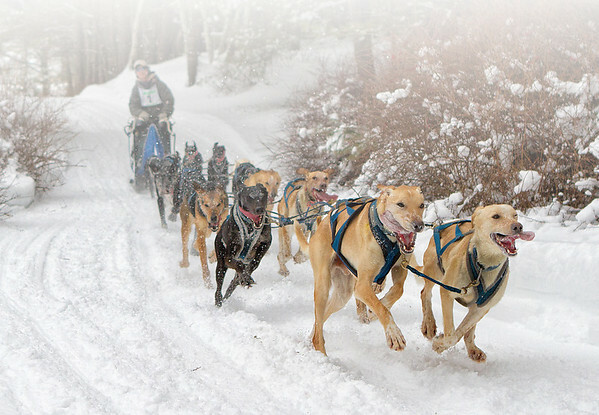 Team 10 of the 6 dog sled dog competition in the LRSD derby 2011.